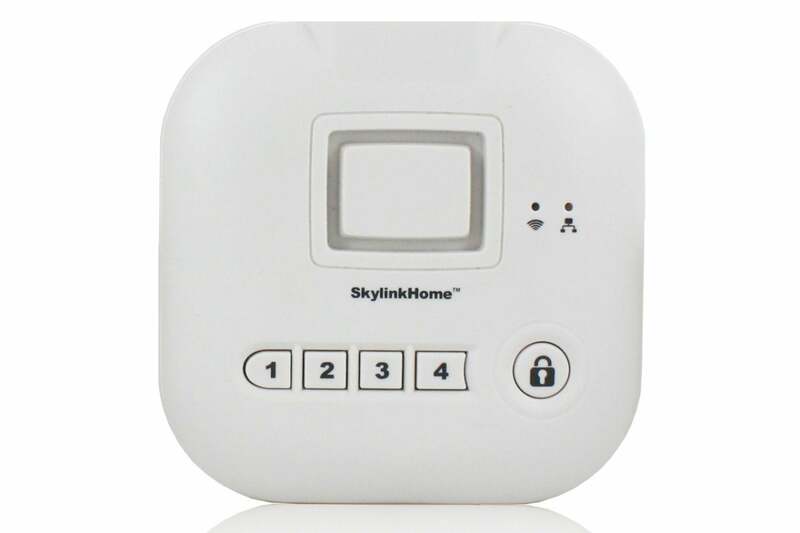 Skylink bills its SkyLinkNet Alarm Systems as the “smart way” to build a home security system. That might be overselling this kit; more importantly it ignores its biggest strength: It’s one of the least-expensive DIY security system on the market. 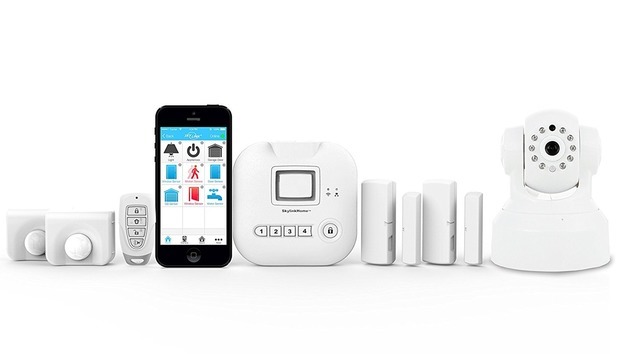 The SkylinkNet Alarm System Starter Kit Plus (model SK-250, $159 at Amazon) reviewed here comes packaged in a collection of little boxes festooned with mismatched stickers indicating what’s what. The plastic components inside, most of which must be pried open to install batteries before use, feel cheaply made, and have zero sense of industrial design. The center of the system is Skylink’s Internet Hub, a do-it-all bridge that connects to your router via ethernet. SkylinkNet doesn’t just make security gear, it also makes cameras, lighting controls, automatic door-opening systems, and even garage-door openers. Any of these components can be tied into the hub, although that doesn’t mean it will all necessarily work together as a unit (more on that later). The hub includes a built-in siren (rated at 110 decibels) and a battery backup—provide your own four AAA—so things will still work if the power goes out. SkyLink's hub must be hardwired to your router, but the rest of the components operate without wires. 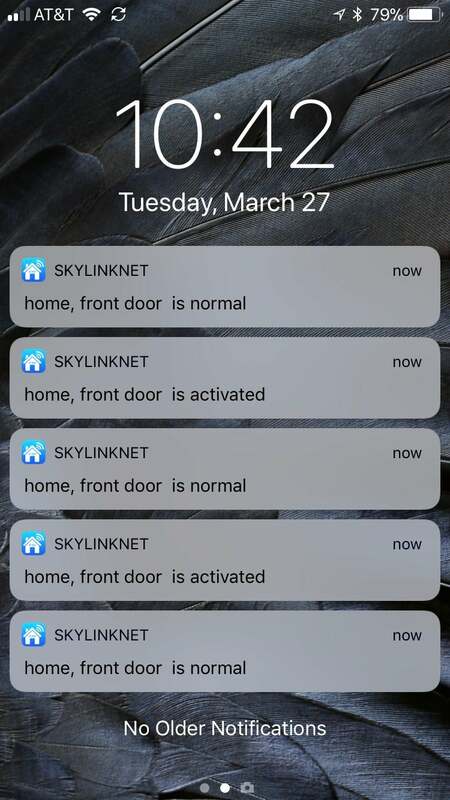 After powering up the hub, the next step is to download and set up the SkylinkNet mobile app, upon which you’re ready to start securing your home by adding sensors. Two door/window sensors ($20 each, a la carte) are included in the box. These are rather flimsy, oversized sensors that attach via screws, sticky tape, or both. One AAA battery is required to power the door sensor, but snapping this all together isn’t difficult. The included motion sensor ($25 for each additional) is more difficult to get open, requiring a coin to jimmy the shell apart. It’s powered by one AA battery and features an unusual design that looks more like a piece of hospital equipment than something appropriate for the home. The final piece of the puzzle is a key fob ($20 for each additional one you want) that lets you arm and disarm the system remotely. Tying all of these things into the SkylinkNet took some trial and error, and most involved pressing a button inside the unit after the batteries were installed to place into pairing mode. The instructions are outlined in the included one-page user guide, but intuitiveness is not the app’s strong point. First you’ll need to set up a SkylinkNet account, after which you can dig into the System Settings menu, where you’re able to add various sensors to the system. In my testing, the sensor was sometimes immediately found and added to the network. On other occasions this took several tries, with obtuse error messages provided along the way. Some of this might be range related—the system relies on unlicensed 433.92MHz radio spectrum—because moving sensors closer to the hub tended to help setup. After settling down for a few hours, all the sensors tended to work accurately, although the remote control was finicky about range, sometimes operating perfectly at 50 feet or more from the hub, sometimes not working at all unless I was in the same room. Users will need to get comfortable with a bit of computerese to understand Skylink’s lingo and master its product. Doors, for example, are not “opened” or “closed,” they are “activated” or “normal.” Some settings, such as the sensitivity of the motion sensor, must be set via an undocumented DIP switch on the sensor’s circuit board. You can turn on chimes for each sensor (enabling chirps if a door or window is open, for instance), but the jarring two-tone sound is closer to the alert you expect to hear when you enter a convenience store, not your home (which might say something about the intended audience for this device). It’s quite easy to arm the SkylinkNet’s integrated alarm. Separate modes are included for “away” (all sensors active) and “home” (motion sensors disabled), and the system gives you a minute to exit the house, emitting an increasingly urgent beeping to let you know it’s time to get out. The same countdown erupts when you come back in, after which you can disarm the alarm via the app or the remote. A $25 keypad is also available as an add-on (it was not sent for this review). If the alarm does go off, it’s probably loud enough to scare off any intruders. As well, you’ll be alerted via push notifications; you can even choose to be alerted to every door or window opening or closing (er, activating and normalizing) if you’d like. Note, however, that no professional monitoring options that will summon first responders are available. This is true DIY stuff. 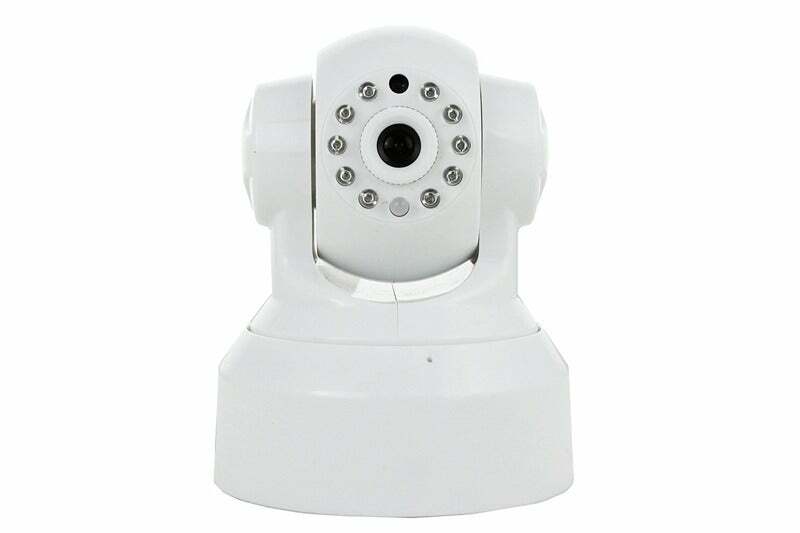 The bundled wireless security camera is a pan/tilt model, but it's limited to resolution of 720p. Skylink includes one of its WC-400PH indoor wireless security cameras in this kit (additional cameras cost $90 each), and I found it a bit more impressive than the company’s sensors. It provides 355-degree pan and 120-degree tilt functions, night vision, and two-way audio. You can access the camera directly through Skylink’s app (there’s a separate icon along the bottom where you’ll find cameras), but it doesn’t exactly integrate with the alarm system. You can’t, for example, set the camera to start recording if the alarm is tripped or a door is opened. 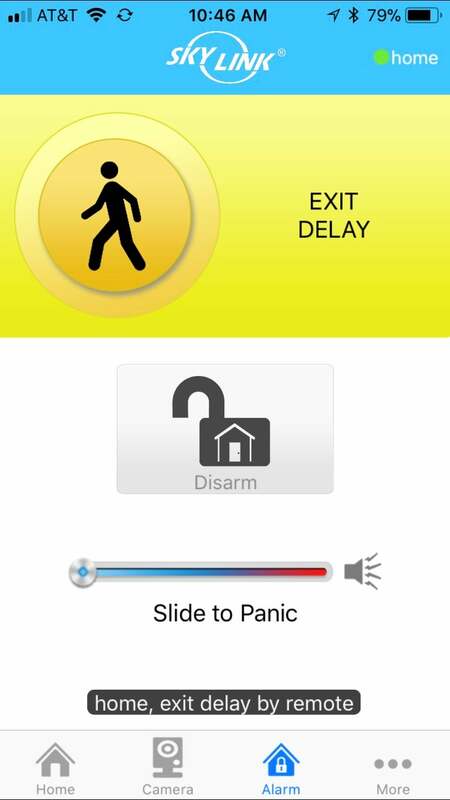 The alarm interface is easy to understand, making it easy to arm and disarm the system. Skylink says that a separate app, SkylinkCam, can be used to record if motion is detected (you’ll need to provide your own microSD card), but I was never able to get the app to work correctly. Within SkylinkNet, however, the camera offers clear 720p image, day or night Pan/tilt operations are slow side, but initiating them is very intuitive: You simply swipe or drag the image preview to reposition the lens in real time. 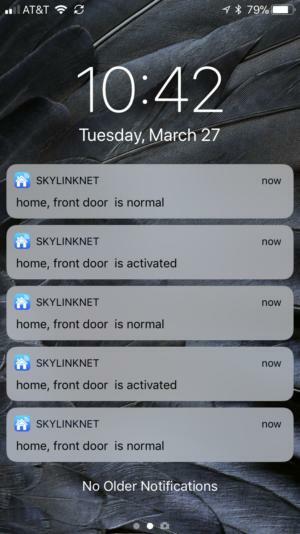 Lastly, SkylinkNet offers limited hooks to other smart home ecosystems, including IFTTT and Alexa. Many of the IFTTT recipes available feel like functions SkylinkNet ought to have built in—such as sending an email if a sensor is triggered—but you can also configure SkylinkNet to, say, turn on an IFTTT-capable light bulb if a sensor is tripped, or arm the alarm system on or off at predetermined times. The Alexa skill is limited to just a handful of commands; namely, letting you turn the alarm on or off or checking your sensors’ status. While SkylinkNet is decidedly basic, it is at least reasonably reliable once you get past the arcane setup. That said, consumers looking for a friendly and intuitive security system are likely to find the SkylinkNet app’s user interface far too confusing and obtuse. Toptal: A new "machine assisted" frontier for management consultants?